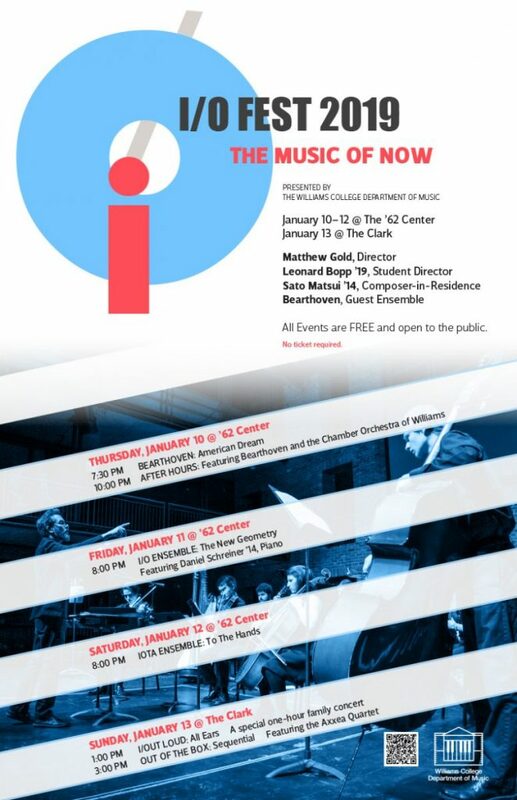 I/O Ensemble is joined by guest composer, Sato Matsui ‘14, and pianist Daniel Schreiner ‘14 for a program featuring important new voices from the U.S., Europe, and our own Williams community. After Hours is a late night program of new sounds and jagged grooves presented in an intimate, informal setting. Featuring Caroline Shaw’s meditation on suffering and refuge, To The Hands, for voices and strings, and works by young Williams-based composers. A special one-hour family concert featuring performances by musicians from Williams College. Kids can explore new sounds, discover new rhythms, and make some noise of their own. Featuring the Axxea Quartet and the Williams Percussion Ensemble. Music for string quartet, percussion, and electronics by Tristan Perich. All events are FREE and open to the public: no ticket required. 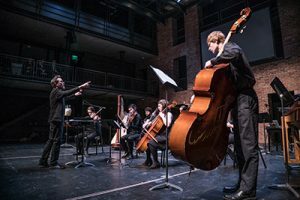 Kick off the new year with I/O Fest, the Williams College Department of Music’s annual expedition into the music of today. Over the course of four days and nights, performers and audiences take an immersive tour through a world of new sounds and adventurous music. With a focus on cutting edge composition and unconventional modes of performance I/O Fest invites listeners to experience music in new ways. Performances, talks, and workshops are held in the ’62 Center for Theatre & Dance and The Clark Art Institute. I/O Fest 2019 features guest ensemble Bearthoven presenting their program American Dream, music by composer-in-residence Sato Matsui, and performances by the I/O Ensemble, IOTA, the Axxea Quartet, and an array of Williams faculty, students, alumni, and guests. I/O invites listeners to experience the music of now. I/O Fest was founded in 2010 by Steven Dennis Bodner, Matthew Gold, and David Kechley.